Thank you for your service. I received the cable I ordered and am very happy with it. I appreciated the personal touch and particularly the minties. You can be assured that you will be my first choice for any future cable products I may need. 4-Port Firewire 1394A PCI Expansion Card for Windows PC + FREE SHIPPING! The easiest way to add FireWire to a desktop PC. Easy access to all your FireWire devices. Installs into a Windows-based desktop computer to add three FireWire 400 6-Pin sockets and one FireWire 200 4-Pin socket. Requires a spare 'full-length' PCI slot and moderate computer knowledge to install. Not suitable for Laptops or Micro-ATX/ITX small form-factor cases. Few technology standards burned as bright or faded as quickly as FireWire. Especially on Windows-based personal computers, support for Firewire has almost disappeared on both motherboards and cases. But the camcorders and external hard drives which relied on FireWire for high-speed data transmission were built to last, so supporting them on modern computers is important - especially if you need to salvage irreplaceable footage or files before you buy new gear. 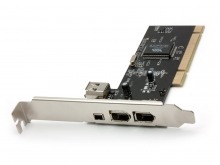 Fortunately, this low-cost PCI expansion card can add much-needed FireWire support to your personal computer. As long as you have a spare full-size PCI slot and know your way around the inside of a PC, this card can be installed in minutes. Drivers are automatically supported under Windows (from XP up) so no special effort is required to get it going. You can then work with all types of FireWire devices at up to 400Mbps, including 9-Pin connectors by using an adapter cable (sold separately). Note: Some video streaming devices like camcorders with a DV output will need a suitable third-party application for viewing live feeds. No software is included with this expansion card, so please be sure to investigate any additional requirements your hardware might have before purchase. Colour: Black PCB with Silver faceplate and sockets. Because USB and FireWire will never get a long together, the only way to add a FireWire connection to your computer is to add an expansion card. This PCI card boasts 2 external 6-Pin, 1 external 4-Pin and 1 internal 6-pin FireWire 400 sockets, and automatically installs drivers under all modern Windows systems.